China has warned anyone found guilty of syringe attacks that led to protests in the western city of Urumqi could face the death penalty, state media reports. Harsh punishment would be meted out to those who carried out stabbings with hypodermic needles, the Xinhua news agency said. 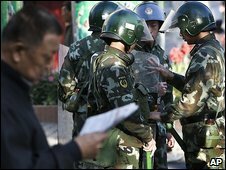 Twenty-five people have reportedly been held over the attacks in the capital of north-western Xinjiang region. Chinese officials have blamed Uighur Muslim separatists for the incidents. At least five people have died this week in ethnic unrest triggered by the stabbings, with thousands of angry Han Chinese staging daily mass protests. The Xinhua report, citing a notice from the municipal court, said penalties for those who stabbed others with syringes containing poisonous or harmful substances would range from three years in jail to the death sentence. Correspondents said Urumqi was calmer on Sunday, although the security presence was still heavy. Riot police have withdrawn from positions around the city and state television showed local officials visiting residents and hearing grievances. On Saturday, Urumqi Communist Party leader Li Zhi and Xinjiang provincial police chief Liu Yaohua were both sacked as Beijing sought to bring the crisis under control. China's Public Security Minister, Meng Jianzhu, has said the syringe attacks were a continuation of unrest in July in which 200 people - mostly Han Chinese - were killed in ethnic riots. Xinjiang's population is evenly split between Uighurs and Han Chinese - the country's majority ethnic group. But Han make up three-quarters of Urumqi's population.